The Nissan Murano is a supremely comfortable and radically styled, but the driving experience is still 100 percent CUV. What do you need to know before you buy a Nissan Murano? Don’t worry, we’ll tell you everything right here in our Buyer’s Guide. Look at that schnoz. It looks wild. So do those headlights and that side profile. The Murano is undoubtedly interesting to look at, and we give Nissan credit for not going for the least offensive design possible. But unfortunately, the driving experience of the CVT-equipped Murano is pure CUV. That is to say, it drives comfortably but unremarkably. The V6 provides enough power to get it to 60 MPH in the mid-7s, which is about square middle in this segment. If you care about how things look this might be your best bet, if you care about handling you could do better. So, for enthusiasts, it’s a bit “meh,” but for non-enthusiasts looking for comfort and convenience, it might just be the ticket. The third generation Nissan Murano launched for the 2015 model year and brought with it radically new styling in what Nissan calls its “V-Motion” front end and “boomerang” headlights. The design is a bit, shall we say, “quirky.” There’s just a lot going on between the busy grille, the sharp headlights, the flowy lines, and that sharp kink in the rear quarter panel. But at the very least, it’s not boring. 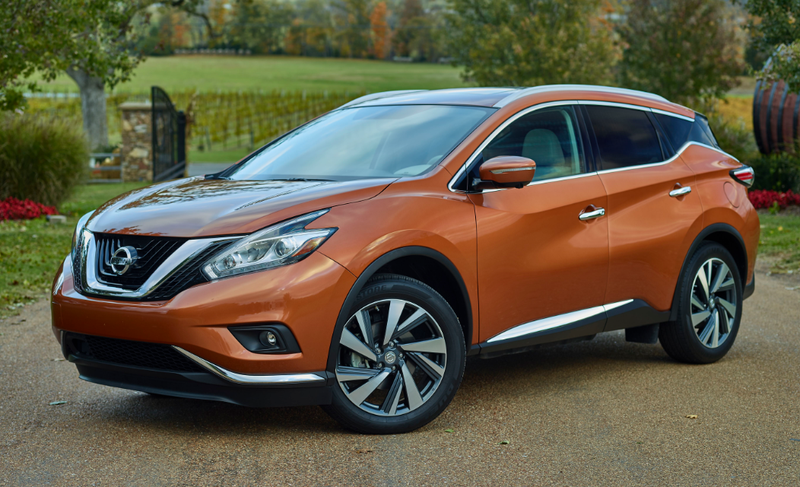 For 2015, the Murano comes with a newly updated interior and a bunch of new safety features like Predictive Forward Collision Warning and Rear Cross Traffic Alert. Standard features are plentiful and include dual-zone automatic climate control, a backup camera, 18” aluminum wheels, automatic headlights, and a seven-inch touchscreen display. If we were in this class, we’d definitely give the Murano a look. We think the Murano really shows its value when cross-shopped with higher-end luxury SUVs like the Lexus RX350, which is why we’d go all-out when spec’ing the Murano. We’d opt for the all-wheel drive Platinum trim, which comes with climate controlled front seats, a heated steering wheel, heated rear seats, LED headlamps, 20” wheels, power heated mirrors, 8” touchscreen with navigation, around view monitor, dual zone climate control, remote start, Bose premium audio with 11 speakers, blind spot warning, rear cross-traffic alert, and tons of other luxury items. We’d then add in the $2,260 technology package, which adds a panoramic moonroof, adaptive cruise control, forward emergency braking, and predictive forward collision warning.